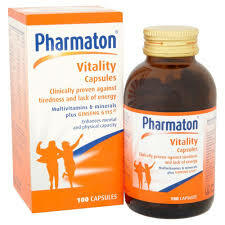 With the winter days fast approaching and the lack of sun, I'm certainly starting to feel tired and lack energy, but its great to know that Pharmaton Vitality Capsules contain vitamins and minerals to help enhance physical and mental performance to relieve the symptoms of fatigue and exhaustion. Excercise - Try to do some gentle exercise even if its a brisk walk around the block. Sleep - Try to get a good nights sleep to help you feel revived in the mornings. Drink - Although its common we don't tend to want to drink as much water during winter months, but we still need our recommended daily intake to maintain a healthy level of hydration and break down toxins. 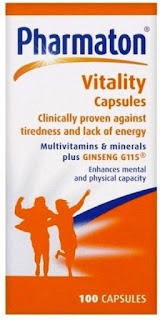 Herbel Supplements - Get into the habit of taking a daily herbal supplement to naturally enhance your energy levels. Why not try Ginseng, an ancient Chinese remedy that has been used to improve thinking and concentration for centuries. TRY Pharmaton Vitality Capsules: These capsules contain ginseng as well as the vitamins and minerals needed to relieve symptoms of tiredness, leaving you feeling mentally and physically alert during the dark winter months. (£9.45, Boots).